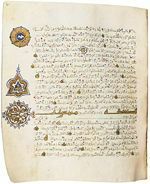 The Qur'an (Arabic: القرآن, al-qur'ān, literally "the recitation"; also called Al Qur'ān, Al Karīm or "The Noble Qur'an"; or transliterated Qur'an, Koran, and less commonly Alcoran) is the holy book of Islam. Muslims (believers of Islam) believe that the Qur'an is the literal word of Allah (God) in Arabic and the culmination of Allah's revelation to mankind. It can be traced back to a man named Muhammad, the last prophet of Islam, who lived around 570-632 AD. Muslims believe the Qur'an was revealed to Muhammad over a period of 23 years through the angel Jibril (Gabriel). Muhammad then dictated the Qur`an and introduced Islam to the world in about 610 AD. Qur'an vs. Bible - There are significant similarities between the Qur'an and the Bible, but also important differences. Search the Qur'an at IslamicCity.com, or use the following links to read specific chapters. When analyzing the manuscript evidence of the Qur'an it does not compare to the New Testament, even though the NT was written centuries earlier. There are a number of troubling passages within the Qur'an. It should however be noted that the term "setting place of the sun" is dismissed in Yusuf Ali's translation as referring to as far west as he could go, because the pool of murky water stopped him from going any further. 93. The Morning Hours, Morning Bright! 107. Small Kindnesses, Almsgiving, Have You Seen? This page was last modified on 6 April 2015, at 20:00.